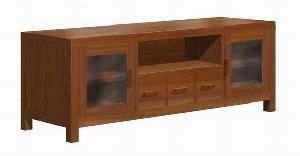 AS-009 : Meuble TV cabinet big with 3 drawers and 2 glass doors from kiln dry mahogany wood. for Living room, TV room, Hotels etc. Color available : dark brown and medium brown. Size : 160 x 55 x 60 cm.